You come home to your beautiful apartment and your shoes are chewed up, the carpet is smelly and wet, and the brand new curtains are ruined. Living in a luxury apartment with a new puppy can be a challenge. Training new puppies isn’t impossible, but it is definitely requires some work. You are already considering Miami apartments for rent or Minneapolis apartments for rent and now you have to worry about training your puppy in a new environment. 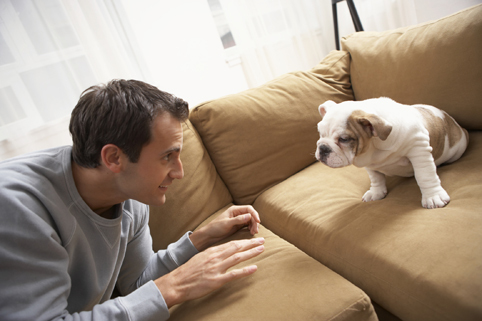 Using these tips on how to “puppy-proof” your apartment, you will come to realize that puppies and apartments can mix! Investigate your apartment thoroughly. Many things that you wouldn’t notice could cause serious injury, or fatal, if your puppy gets to it and starts chewing. It pays off to spend some time puppy proofing your apartment. A “home of comfort” often includes the comfort of having a loving pet. Over 85% of our communities are pet-friendly and offer pet perks to give our four-legged residents a home of comfort and convenience too! Check out any of our communities on LincolnApts.com for pet policies and amenities!